The total value of retail sales and consumer services was estimated at VND3,235 trillion (roughly US$138.2 billion) in the first nine months of 2018, a year-on-year increase of 11.3 per cent, according to the General Statistics Office. If the inflation factor was excluded the growth would be at 8.8 per cent, a little bit higher than the same period last year (8.76 per cent). The retail sales of goods reached VND2.4 trillion (US$10.2 billion) in the first nine months of this year, occupying 75.2 per cent of the total sales and up 12 per cent over the same period last year. The accommodation and food services, which accounted for 12.3 per cent of total sales, recorded a value of VND396 trillion (US$16.9 billion) during the period, a year-on-year rise of 8.4 per cent. The travel services brought in VND30.3 trillion (nearly US$1.3 billion), making up 0.9 per cent of the total value and is up 16.9 per cent over the corresponding period last year. The sales of other services during the first nine months reached VND375.7 trillion (over US$16.05 billion), a hike of 9.7 per cent in comparison to the same period last year, contributing 11.6 per cent to the total value. 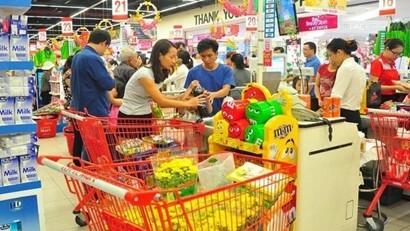 In September alone, the total value of retail sales and consumer services was estimated at VND374.8 trillion (US$16.01 billion), up 1.3 per cent from the previous month and a year-on-year increase of 12.5 per cent.